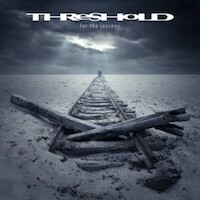 Since the return of old vocalist Damian Wilson, the career of Threshold seem to have gotten a second run. It was no secret that their singer, the fantastic Andrew “Mac” McDermott, who replaced Wilson in the band back in 1998, had his fair share of problems, mainly alcohol problems to be precise and he did leave the band in 2008 before his alcoholism (kidney failure) took his life in 2011. A tragedy, of course and Mac is still being missed by Threshold-fans all over the world. Musically, it’s sad that such a gifted singer with such an amazing voice couldn’t keep delivering the goods because of the demon alcohol. Albums like Hypothetical (2001), Critical Mass (2002), Subsurface (2004) and Dead Reckoning (2007) are today looked upon as Threshold classics and rightfully so. In many fans eyes, Mac is seen as the true vocalist for Threshold even though he was preceded by no less than three other singers – Wilson, Jon Jeary and Glynn Morgan. It’s also easy to see that Threshold’s life with Mac in the band had come to a halt after 2004 – the space between records had increased more and more by each album. For obvious reasons, it took Threshold some five years to finally release a new record with Wilson back behind the mike, but when March Of Progress finally arrived in 2012, it showed a band that had steeled themselves and meticulously made sure that nothing was left to coincidence. It was a brilliant record, fully as classy and mind-blowing equivalent masterpieces like Subsurface or Dead Reckoning. When it comes to Threshold, I was a late bloomer, so for me, Mac was always THE Threshold singer, so Wilson’s voice took a little while for me to get used to, but since March Of Progress didn’t leave my playlist on my phone since the album came out, I’m now fully comfortable with it and not only that, I think his voice is bloody fantastic. The fact that the band is in good health today speaks for itself when you think of all the touring they have done since their last CD release and still managed to put out a new record after only two years. The name Threshold has been much talked of since their last album and I guess they wanted to strike while the iron was still hot, but how would this affect the quality of the music? Would they put out a rush job of an album or would they once again floor me and the rest of their fans? “Watchtower On The Moon” opens the album and I am instantly on a time travel back to 2007 and “Slipstream”, my favourite Threshold song. No it’s not a clone by any means, but it is sure enough raised on the same protein and iron. Let’s just say that the two songs are related and that this too is a fantastic tune. “Unforgiven” is a ballad-like slow and dark tune that could have been off the Dead Reckoning album. That makes it awesome! “The Box” is a progressive killer, long, big and epic and it has an Ayreon vibe to it, only a little more accessable, “Autumn Red” has a huge pop feel to it but still sounds very much like Threshold and “The Mystery Show” is plain marvellous – it’s a huge, long, progressive metal tune that glistens with some of the finest hooks and some cathiness to die for. “Siren Sky” is a complex hard rock tune, typical Threshold and a killer tune as the album’s closer. But – as usual – if you get your hands on the deluxe edition, you’ll get a bonus track, on this album called “I Wish I Could”. And it kinda pisses me off, because the song is way to good to be reduced to a bonus track when it should be in the regular track list. It’s a very catchy hard rocker that has a contagious groove and is one of the finest moments on this, close to perfect album. I’ve heard and read that some people find Threshold a band that are mostly on repeat these days and that they don’t come up with anything new anymore and that every album is just a rewrite of the one before. I wouldn’t agree on that if my life depended on it. Yes, Threshold has a style of their own – more than you could say about many bands out there – and sure, there are bits and pieces here and there that you’d might recognise from days gone by, but they are not stealing from themselves or going on repeat. Those tedious intimations are just sad and unnecessary. If people want to throw such crap on musicians, then try Yngwie Malmsteen’s last 15 years or so. Fortunately it seems like the negative fans are a minority here. Personally, I’m pretty damn impressed with the way that this band manages to come up with quality so high and such strong creations every time they release an album. When it comes to this album, it could pretty well be their best effort to date. If you wanna draw a comparison to the past then I believe this album is equivalent to Dead Reckoning both in song structure and production. The all round feel is that Threshold has gotten a new spark and in many ways the band feels born again – now they’re firing on all cylinders in whatever they do. It’s really time for this band to get their well-deserved big break with this album. They are progressive, but not Dream Theater progressive, they have more regular hard rock and metal structures and their song are catchy enough to win over even the most anti-prog fan out there. So if you wanna go out on a musical journey, then do it with this album. It is, after all, made for that purpose, as the title says. An album of the year contender, without a doubt.